Most of us who frequent the Bonifacio Global City have seen the more than a dozen works of art spread all over the area surrounding all those business establishments and buildings. These include the murals that vibrantly fill an otherwise dull sight of certain areas especially the firewalls of buildings. I love the astronaut mural which can be seen painted on the firewall of the Icon Plaza building somewhere at The Fort area, and very near is another masterpiece showing a lady comfortably chilling on a sofa with her cat and some other stuff that makes the mural a lot more interesting, and of course, they also have a huge mural of Andres Bonifacio himself done in a way that even Bonifacio will be proud of. There's a lot more smaller paintings all over BGC that will sure catch our attention, and I am glad that the people behind this project are at it again. The artists who painted all those masterpieces or "obra" are indeed full of creative and imagination thus some of them will be coming back again to showcase once more their magnificent visions of various colors, shapes and sizes. 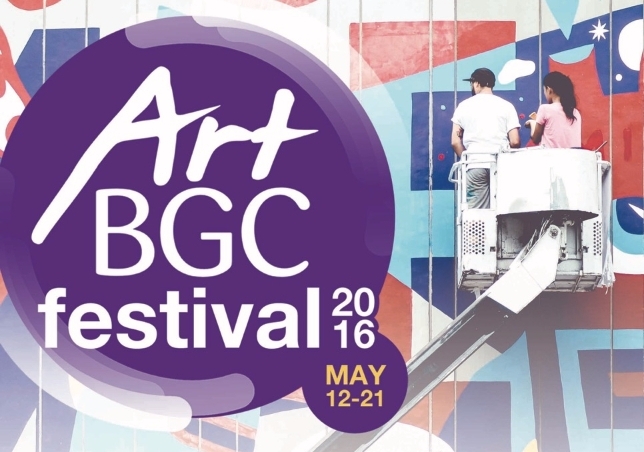 Splashes of color are ready to fill the walls of BGC as Bonifacio Art Foundation, Inc. (BAFI) celebrates ArtBGC Mural Festival 2016. A press briefing was held on May 10 at Seda Hotel BGC to officially introduce the festival. Now on its sophomore run, ArtBGC promises vibrant new murals and programs to make art and culture more accessible to BGCitizens. The festival is done in collaboration with LA-based art consultancy LeBasse Projects and Honeycomb Communities. Multi-disciplinary artists such as: PastelFD, Andrew Schoultz, HOTxTEA, Bunnie Reiss, Aleks Kocev and Blaine Suque are bringing in their unique brand of creativity, hoping to build on the iconic atmosphere of BGC. Representing the Philippines in this festival are Kris Abrigo, Trip63 and ArtBGC Open Call winner, KFK. All artists, international delegates and select guests of BAFI will be treated to a welcome dinner hosted by the local government unit of Taguig. Keep an eye out for these talented individuals this May 12 to 21 as they make their mark on W 5th, NET One, Bonifacio High Street, Bonifacio Stopover and BGC Corporate Center. I am excited to have been given the opportunity to interview some of them. I would like to interview all of them if time permits but even just one up close and personal interview with one of these artists would already be a blessing. I'm a frustrated artist who never got to fulfill my dreams because fate decided to put me on a different field of interest. I still remember those days when I used to come up with my own comic books using my own characters inspired by many of the cartoons and comics I grew up with as a child. I collected comics and magazines all related to the appreciation of arts in all forms from comics, CGI animation, sketches to paintings, sculptures and the likes. 1. The Alveo Art Tours are designed to walk you through the different mural sites – old and new. These daily tours start at the Alveo showroom along 28th Street. 2. The Mind Museum will host Cafe Scientifique – a world-wide movement to bring science closer to the public through conversation. Public art will be discussed and dissected on May 14. Both events are free and open to the public. 3. Community takes on a bigger role this year. Coming from last year’s hype, BAFI was able to develop a small army of volunteers that will either be apprenticing under the muralists or running around BGC as part of the Street Team. Volunteers will be rehydrating and recharging at Burgos Eats thanks to Max’s Group. 4. BAFI is also partnering with Fort Bonifacio Development Foundation, Inc. (FBDFI) to bring art to BGC’s neighboring communities. The artists will be painting with the children of Taguig on the afternoon of May 16, leaving behind unforgettable memories and a colorful mural. I hope to contribute my own share to proliferate the love for arts through my blog by helping featureould be new, emerging and top artists. I may not have been able to become one, at least I would be able to inspire others to pursue their dreams or at least make it as a hobby or pastime. Most of the youth nowadays are glued into their digital gadgets and devices so maybe even digital art would suffice. Still, there's really nothing better as compared to actually lifting a paintbrush and executing those artworks using our hands and getting dirty and sweaty from all that hard yet personally satisfying work we can be proud to call our masterpieces.